We all want to look and feel better. We also realize that just eating real whole food and moving on a regular basis is rarely enough. We often end up looking for that special item that will tip the balance in our favor. This typically takes the form of supplementation. Most people supplement by going after the symptom. In the long term it rarely if ever works. The optimal use of supplements is to support, substitute and stimulate metabolic function. As everyone is metabolically unique, I rarely suggest any supplement be used by everyone. That being said, what I do know is that a healthy functional gut is vital if you want any chance of looking and feeling your best. Just about every health challenge originates in the gut. I don’t know about you but that sounds darn impressive. What could possibly have such influence over the body? The answer is a specific blend of probiotics. What Are Probiotics? Our ancestors had a diet brimming with nutrients and beneficial species of live bacteria because they lived off the land. These species of live bacteria evolved into an essential component of our digestive system – probiotics. Probiotics regulate the digestive system, improve immune function and serve as the first line of self defense against infections. What If I Don’t Take Probiotics? Digestive health is paramount to our overall health. An unhealthy digestive system results in an over-growth of bad bacteria and yeast. Food cannot be broken down properly, essential nutrients are not absorbed, the immune system is compromised leaving us fatigued and rundown. Over-growth of bad-bacteria leads to a higher risk of infections, allergies and inflammation, which can lead to symptoms of constipation, diarrhea, gas, bloating, acid reflux disease, eczema and often weight gain. What Kind Of Probiotic Should I Take? Not all probiotics are created equal. For a probiotic to perform its necessary function, it must naturally survive the stomach’s harsh environment and arrive in the intestines alive. A true probiotic is a species found in our environment, as well as in our digestive system. Over 95% of probiotic products in the marketplace today do not meet these criteria. To date, the most researched and widely used true probiotic strains are from the bacillus species. The key is to consume strains that have been proven to impede the growth of unwanted bacteria and yeast, while strengthening the immune response and producing essential nutrients at the site of absorption. Designed by Nature: MegaSporeBiotic™ is formulated with nature in mind. Spores, derived from the word “seed,” are the most basic building block of a new cell. Found naturally in our environment, spores are a robust and effective way of delivering probiotics. Once they reach the intestines, they go to work strengthening the immune system and protecting you from infection. Stomach Survivor: Our scientists have found a way to deliver these probiotics safely to the digestive system. These strains have a tough natural outer shell that protects them from the stomach acid. This key feature is what makes MegaSporeBiotic™ effective and what separates it from all the other probiotic products. Antioxidant Benefits: MegaSporeBiotic™ introduces HU36™, the first commercially available carotenoid rich probiotic. This strain naturally produces forms of lycopene, astaxanthin, zeaxanthin, beta carotene and lutein in your digestive tract right at the site of absorption. This makes them the most bioavailable antioxidant known to science. No Refrigeration: Traveling with MegaSporeBiotic™ is convenient, uncomplicated and practical because it does not require refrigeration. If the probiotic is so fragile it requires refrigeration, how will it survive the high temperature and acidity of the stomach? It won’t. MegaSporeBiotic™ survives and arrives at the site of colonization alive, so it can perform its probiotic function! What’s The Catch? None really, other than very basic, considerations. To fully take advantage of what this product offers, you want to be consuming a diet of real whole foods, that are right for your type. You can’t out supplement a poor or inappropriate diet. I still encourage everyone to consume raw fermented foods such as real sauerkraut and kimchi due to the positive impact upon the pH of your intestinal tract. Also important is to decrease overall stress loads. When you are stressed you enter the fight or flight response. This results in a reduction of blood flow to internal organs towards your extremities to physically prepare you for battle. This is a hardwired response in everyone. When blood flow is decreased to your stomach and intestinal tract, it functionally slows down. Any benefit that can arise from that function is therefore reduced producing a cascade effect downstream. Considering that nutrition drives cellular function of all tissue, glands, organs and complex systems this is a bad approach to looking and feeling your best. 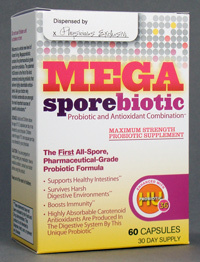 Lastly, you may have noticed above that MegaSporeBiotic™ is only sold through health practitioners. Lucky for you, they are currently the only supplement that I keep in stock. Contact me directly for more information regarding price and usage. If you are not local, I can ship to you.